Buying a winter coat is always an investment, so most of us err on the side of dullness to make sure it goes with just about everything. Avoiding all-over print doesn’t have to mean boring, though, with this Evening Stroll coat from Mod Cloth. 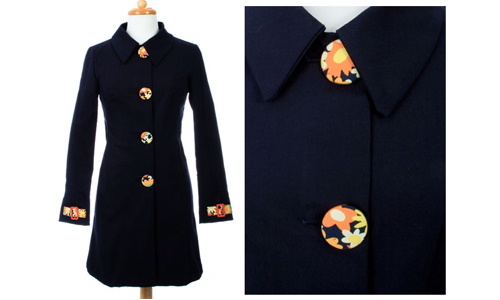 With a classic basic swing coat design, the daisy print buttons and cuff details make this a great sixties look fit for Carnaby Street in its pomp. The fitted waist and oversized buttons give this that cute dolly edge without being too girlish. It’s available online from Mod Cloth for $114.99.